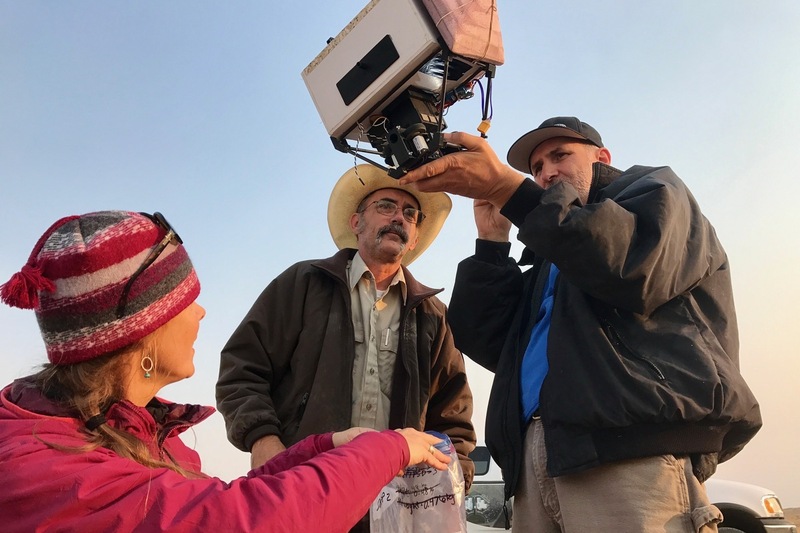 Biologists With Drones And Peanut Butter Pellets Are On A Mission To Help Ferrets To increase populations of the endangered black-footed ferret, scientists aim to save prairie dogs, a main food source. The biologists use drones and medicated peanut butter-flavored pellets to do it. Black-footed ferrets are the most endangered mammal in North America. Scientists in Montana are trying to save the ferrets by saving their main food source, prairie dogs. In central Montana, drones are dropping peanut butter pellets on prairie dog colonies. It's part of an effort by biologists to save North America's most endangered mammal — the black-footed ferret (or as the U.S. Fish and Wildlife Service calls it, the BFF). Prairie dogs make up the vast majority of a BFF's diet. Save the food and you save the ferret, biologists wager. Under a half-crescent moon recently, Fish and Wildlife biologist Randy Matchett swept a spotlight back and forth over a cold, black prairie. Suddenly a pair of brilliant green eyes popped out of the darkness. "Look at those eyes," he said. "Don't those eyes look amazing?" He has found a ferret, just what he was looking for. Matchett works with Kristy Bly, a senior biologist with the World Wildlife Fund. "They are these ferocious, masked bandits of the prairie," Bly said. "They're like these little [toy] Slinkies." 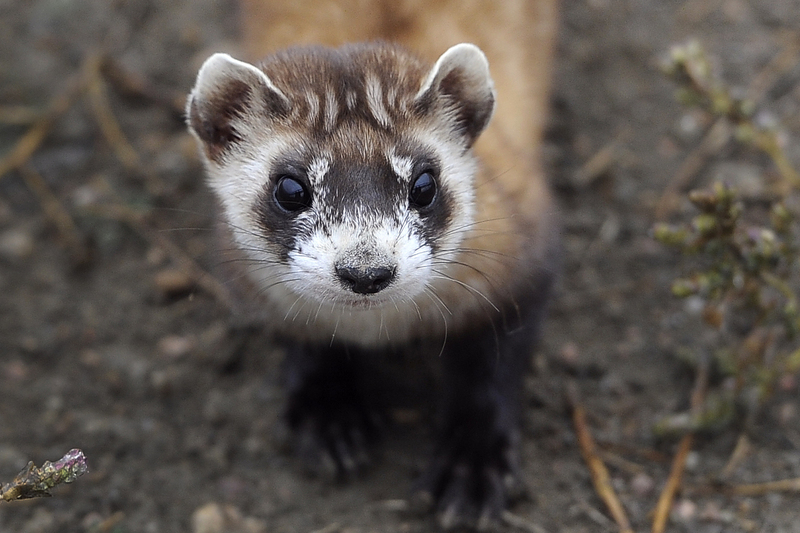 A black-footed ferret at UL Bend National Wildlife Refuge in Montana. "Prairie dogs are Chicken McNuggets of the prairie, where so many species eat them," Bly said. But in recent years, prairie dog towns across the American West have been exposed to a deadly disease called sylvatic plague. While it's treatable in humans, sylvatic plague can wipe out entire prairie dog towns in less than a month. And that means no more food for endangered black-footed ferrets. Kristy Bly, Randy Matchett and Kurt Kreiger inspect part of a drone at UL Bend National Wildlife Refuge in Montana. Drone pilots fly the machines across the prairie, dropping blueberry-sized pellets about every 30 feet. They are flavored to taste like peanut butter, and prairie dogs love peanut butter. The kicker is that they're laced with a live vaccine that protects them from the plague. Bly said if they can stop the plague from killing prairie dogs, the endangered ferret's population could grow. Using drones helps that happen faster. In the past, scientists delivered the vaccine baits by hand. Drones cover a lot more ground. But this is only the second year anyone has used one to save ferrets, so there are still a couple of kinks, like when a drone suddenly veers off its preset path and begins to head home. Kurt Kreiger, the drone's pilot and engineer, coaxes his machine — named Shep — to the ground. The team huddles around it, pulling pieces apart and inspecting the pellet shooter. When the drone stops working mid-flight, they have to take it apart, fix it, then refill it with pellets and move on to the next "patch" of land they aim to vaccinate. A team of scientists and engineers prepare to launch "Shep" the drone over UL Bend National Wildlife Refuge. Once the team fixed Shep, they refilled it with peanut butter pellets. If all goes well it's right back up for another delivery. By the end of this day, they hope to expose more than 4,000 prairie dogs to the vaccine. Past field trials have shown that prairie dogs living in vaccinated areas survive waves of the plague. And when the prairie dog can beat the plague, Bly says it's good for everything, including the ferret. "Without [the ferret], do we really have a complete ecosystem?" Bly asked. "You start taking those pieces apart, it's like a domino effect. When we have ferrets on the landscape the piece of the puzzle that is the American prairie all fits together."